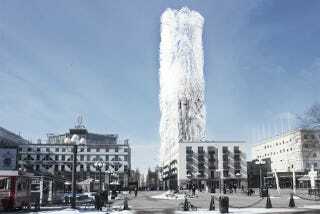 Looking for an alternative to turbines for capturing wind energy, Belatchew Arkitekter has proposed adding a hairy addition to Stockholm's Söder Torn. It would serve as more than an architectural toupee, capturing energy through the movement of all those tiny straws. The straws of the facade consist of a composite material with piezoelectric properties that can turn motion into electrical energy. Piezoelectricity is created when certain crystals’ deformation is transformed into electricity. The technique has advantages when compared to traditional wind turbines since it is quite [sic] and does not disturb wildlife. It functions at low wind velocity since only a light breeze is sufficient for the straws to start swaying and generate energy. The existing premise on top of the building is replaced with a public floor with room for a restaurant. The new extension creates, a part from the energy producing shell, room for the citizens with the possibility to reach a lookout platform at the very top of the tower with an unmatched view of Stockholm. The idea is that the residential building would double as a power plant, and from the ground, the building would appear as a living, breathing object stretching into the sky.